Profile of trail from Echo Lake to Tahoe City. Elevation grid is 500 feet and starts near the bottom at 6,500. A view of a steep rocky section of the trail. Look at the snow patch in the center of the picture. Water flowing from Fontanillis Lake above and below. View of Richardson Lake from the tent. 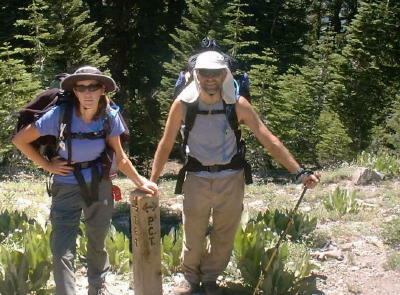 Composite picture where the TRT leaves the Pacific Crest Trail. Celebrating arriving at Tahoe City, hamburger, fries, and Sierra Nevada Pale Ale.